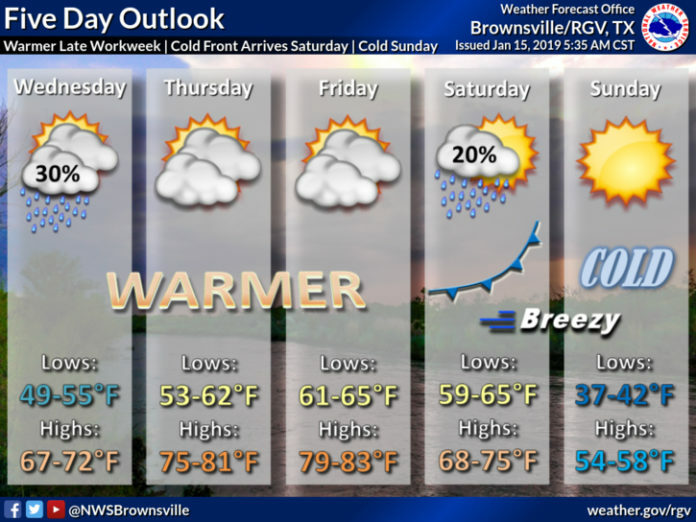 Expect overcast skies, cool temperatures and light rain Tuesday, according to the National Weather Service in Brownsville. Inland Rio Grande Valley will see highs hover around the mid 50s. Closer to the coast, temps will be in the low 60s. After Tuesday, the Valley will see a warming trend. On Thursday and Friday, temperatures in some parts of the region with reach the low 80s. By the end the week, however, temperatures will drop as a cold front arrives. On Sunday, highs will be in the 50s.